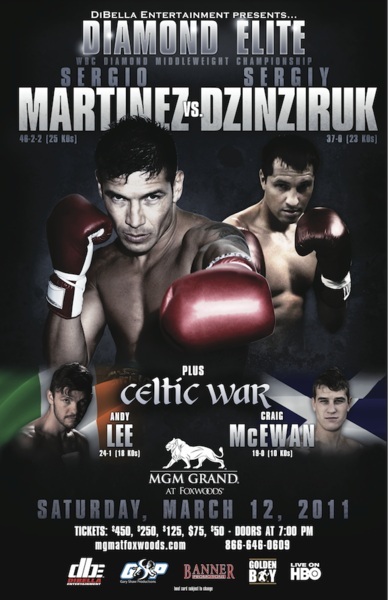 First televised fight up was a middleweight bout between Andy Lee & Craig McEwan. It was a decent fight overall. The one most surprising thing to me was the fact that Andy Lee had a chance to look impressive against someone he should have had no problems with and he failed. Yes, Lee did knock McEwan out in the 10th and final round, but it was just a save, in reality. He did not look impressive at all. He looked flat and his punches didn’t carry any power through most of the middle rounds. The sting didn’t really appear in his punches until around round 7.
Credit where it’s due, McEwan had all the heart in the world. In the end it wasn’t enough. There are fights every so often where a fighter loses (for whatever reason), but everyone except for the opponent believes he did so much right that the loser deserved to win. Craig McEwan deserved to win in my book. My book doesn’t matter to fate though because Andy Lee plain old took him out in the last round. This fight did nothing for my thoughts on Andy Lee, except to prove that he is not near ready for a real step up in competition. You would be half right. Okay, that is a bit harsh and unfair to Dzinziruk. He fought for many years in Europe taking on mostly cupcakes, building up a sparkling 37-0 record. Not until 2010 did he appear here in the United States for a fight. Enough about Dzinziruk. Sergio Martinez was the real story of the night. Once again Maravilla has proven to the world that he is in fact one of, if not the most, entertaining fighter alive today. It doesn’t matter who he is even matched up with at this point. It’s not to say he can’t or won’t be beaten, but it is to say that no matter who he is matched up with it’s sure to be pure entertainment. Martinez’ style is tailor-made for action. He consistently leaves his hands down inviting, almost daring, his opponent to throw. This is the same style he used against Dzinziruk who was just too slow to really catch Martinez with anything of substance. His jab had been highly touted, but it left much to be desired. It was slow and against a man like Sergio Martinez who has the fastest hands from 154-168. Martinez was in control of the nearly every second of every round. Through the first six rounds he had a clear 6 rounds to nothing lead. Dzinziruk won the 7th round and actually appeared to have found something with his jab and extremely heightened aggression that had been absent from the first six rounds. He never hurt Martinez, but he did catch him more than once flush. Then the 8th round came. Martinez adjusted ridiculously fast, coming out and stuffing his own jab into Serhiy’s face. His jab was so strong and stiff it could have easily passed as a straight. Those jabs led to clean body shots and combinations that overwhelmed Dzinziruk as he was knocked down three times and Arthur Mercante Jr. waiving the fight off. As far as Sergio Martinez’s future goes I would love to see him take on either Dmitry Pirgo at middleweight or either Andre Ward or Lucian Bute at super middle. One thing is for sure, if Sergio Martinez is involved there will be action.